It is that time of year again. What has become a time of disinhibited hijinx and mayhem, and a growing marketing bonanza for the kitsch-manufacturers and -importers, has primeval origins as the Celtic New Year’s Eve, Samhain (pronounced “sow-en”). The harvest is over, summer ends and winter begins, the Old God dies and returns to the Land of the Dead to await his rebirth at Yule, and the land is cast into darkness. The veil separating the worlds of the living and the dead becomes frayed and thin, and dispossessed dead mingle with the living, perhaps seeking a body to possess for the next year as their only chance to remain connected with the living, who hope to scare them away with ghoulish costumes and behavior, escape their menace by masquerading as one of them, or placate them with offerings of food, in hopes that they will go away before the new year comes. For those prepared, a journey to the other side could be made at this time. It is fortunate that Hallowe’en falls on a Monday this year, as there is evidence that the pagan festival was celebrated for three days. With Christianity, perhaps because with calendar reform it was no longer the last day of the year, All Hallows’ Eve became decathected, a day for innocent masquerading and fun, taking its name Hallowe’en as a contraction and corruption of All Hallows’ Eve. All Saints’ Day may have originated in its modern form with the 8th century Pope Gregory III. Hallowe’en customs reputedly came to the New World with the Irish immigrants of the 1840’s. The prominence of trick-or-treating has a slightly different origin, however. Jack-o’-lanterns were reportedly originally turnips; the Irish began using pumpkins after they immigrated to North AMerica, given how plentiful they were here. The Witches’ Sabbath aspect of Hallowe’en seems to result from Germanic influence, and fusion with the notion of Walpurgisnacht. (Familiar with the magnificent musical evocation of this, Mussorgsky’s Night on Bare Mountain?) 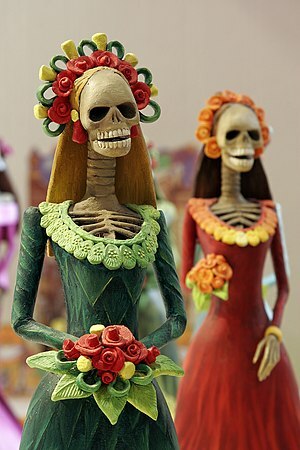 Although probably not yet in a position to shape mainstream American Hallowe’en traditions, Mexican Dia de los Muertos observances have started to contribute some delightful and whimsical iconography to our encounter with the eerie and unearthly as well. What was Hallowe’en like forty or fifty years ago in the U.S. when, bastardized as it has become with respect to its pagan origins, it retained a much more traditional flair? For my purposes, suffice it to say that it was before the era of the pay-per-view ’spooky-world’ type haunted attractions and its Martha Stewart yuppification with, as this irreverent Salon article from several years ago [via walker] puts it, monogrammed jack-o’-lanterns and the like. Related, a 1984 essay by Richard Seltzer, frequently referenced in other sources, entitled “Why Bother to Save Hallowe’en?”, argues as I do that reverence for Hallowe’en is good for the soul. In any case: trick or treat!